But I have a plan for keeping this blog more up to date. I run two businesses, as some of you will know, and unfortunately, while this one is my secret favourite, the other one takes up most of my time. I don’t update this blog often, and that’s not because I am too lazy to update it, it’s because I’m not doing very much that’s relevant to this business. Here is my proposed solution; rather than just using this blog for abeautifulpalegreen, I will use it as my personal blog as well. I’m not going to be going in for introspection and myspacey whining by any means- I’ll mainly be talking about my adventures in getting fitter. 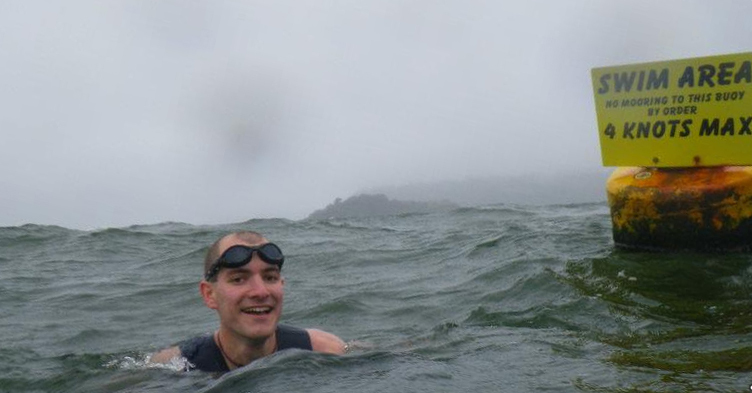 For example, I am currently training for a long distance swimming event here in Plymouth- it’s called the breakwater swim, and it’s 2.2 miles swimming in a straight line from the breakwater to Plymouth Hoe. It’s a big deal- it’ll be the furthest I’ve ever swum- and it’s also for a great cause! Should you be so minded, you can check out my JustGiving page, and donate! I’m planning to get a touring bike and see a bit more of the world, too, and this’ll be a cool place to discuss that. A few years ago, some friends of mine and I kept a video blog for a year, and documented some great times. I miss that. I still have great times, I just don’t record them anymore! I will change that, starting today! It was a nasty, cold, windy, rainy, foggy day, and it was AWESOME. The breakwater is about two miles behind me in this picture. You’ll notice that I’m avoiding looking at it! If none of that lifts your luggage, don’t despair! I’ll still be updating with details about all my abpg projects. This entry was posted on Tuesday, July 17th, 2012 at 9:02 pm	and is filed under adventure. You can follow any responses to this entry through the RSS 2.0 feed. You can leave a response, or trackback from your own site.